When you play the Game of Thrones, you win or you die. Or, you open with an elbow strike, follow it with a spinning back-fist and finish your opponent with a ground-and-pound. Along those lines: Mixed martial arts fighter Conor McGregor will appear in one of Game of Thrones‘ final two seasons, UFC president Dana White recently said during an interview on Fox Sports Live. White did not say which role McGregor would play. A rep for the HBO series told TVLine the network does not comment on casting rumors. 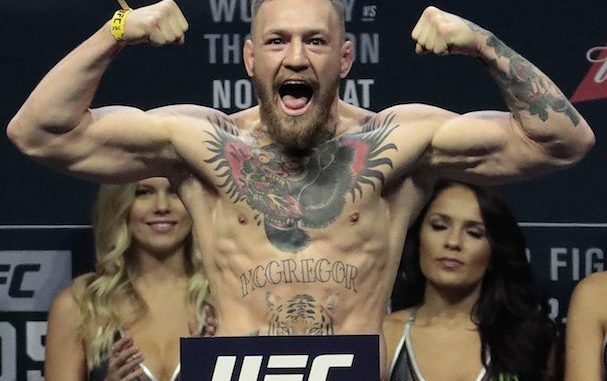 Perhaps McGregor will somehow take on the undead, freakishly strong Gregor “The Mountain” Clegane? After all — as the video below shows us — the MMA featherweight and Clegane’s portrayer, Hafþór Júlíus Björnsson, are already acquainted. Winter is here…and you’ll do fookin nuttin bout it!